Music is composed of five main properties: pitch, dynamics, duration, tone and color. Another aspect of music is a succession of tones or notes played as a part of a musical composition, known as a melody. 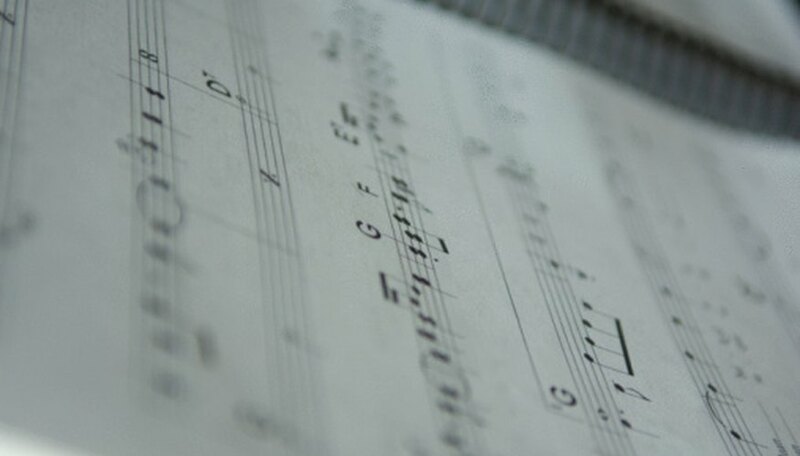 As you become familiar with the song, you learn when to anticipate a rise or drop in the notes. The melody, along with tone, color, dynamics, duration and pitch, set the mood of the song. The pathet is used in Gamelan music, which originates in Indonesia. This musical melody is similar to another melody type -- the mode. Several pathet arrangements make up a Gamelan composition, states the Opentopia website. Six pathet have been identified, with three used for the pelog and siendro tuning systems. The pelog pathets are called the pelog nem, pelog nima and pelog barang. The siendro pathets are called the siendro nem, siendro sanga and siendro manyura. As it is played in Gamelan music, the pathet is percussion dominated. Gongs and chimes are most prominent in this music, along with metallophones, according to the Northern Illinois University website. The pelog tuning system consists of a seven-tone scale with half-steps. The siendro scale is a pentatonic scale with no half-steps. The Gregorian mode or chant is organized around pitch. This particular melody originated in the Catholic church and is named for Pope Gregory I. This particular melody is also called “church mode,” as it originated from the Roman Catholic ecclesiastical tradition, states the Kosmix website. The Gregorian mode (chant) eventually became the dominant form of music throughout the medieval western and central European regions and dioceses. The echos melodic form originated from the early Byzantine liturgical chant. Eight echoi stem from Syrian music, with the echoi concept being seen in the Coptic chant, Russian and Armenian music, according to the Encyclopedia Britannica website. St. John of Damascus is usually given credit for the Byzantine echoi. This melody is not a scale. Instead, it is groups of melodic formulae that are combined to form whole melodies. A mode is an “ordered series of musical intervals.” When the key, or tonic, is included, this defines the pitches in the intervals. Mode is only applied to the specific diatonic scales, states Opentopia. “Melody” refers to a “series of single tones which add up to a recognizable whole.” It has a beginning, an end and movement. Melody moves up and down the musical scale by leaps (large steps) or steps or small intervals, the History of Music website explains. Melody is affected by its tempo -- when it is played smoothly, this is called “legato.” Short, sharp notes are called “staccato” while very short notes called “spiccato” are played by stringed instruments.